From breakfast to dinner and the snacks in between, you’re entire day can be heart healthy! A good for you diet doesn’t have to be bland or boring. Here are some foods that will leave you satisfied. Oatmeal: Start your day with a steaming bowl of oats, which are full of omega 3 fatty acids, folate, and potassium. This fiber rich superfood can lower levels of LDL or bad cholesterol and help keep arteries clear. Opt for coarse or steel cut oats over instant varieties, which contain more fiber, and top your bowl off with a banana for another 4 grams of fiber. Salmon: Super rich in omega 3 fatty acids, salmon can effectively reduce blood pressure and keep clotting at bay. 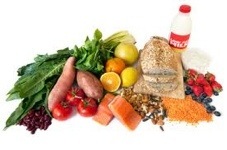 Aim for two servings per week, which may reduce your risk of dying of a heart attack by up to one third. Salmon contains the carotenoid astaxanthin, which is a very powerful antioxidant. But be sure to choose wild salmon over farm-raised fish, which can be packed with insecticides, pesticides, and heavy metals. Not a fan of salmon? Other oily fish like mackerel, tuna, herring, and sardines will give your heart the same boost. Avocado: Add a bit of avocado to a sandwich or spinach salad to up the amount of heart-healthy fats in your diet. Packed with monounsaturated fat, avocados can help lower LDL levels while raising the amount of HDL cholesterol in your body. They allow for the absorption of other carotenoids, especially beta carotene and lycopene, which are essential for heart health. Olive oil: Full of monounsaturated fats, olive oil lowers bad LDL cholesterol and reduces your risk of developing heart disease. Results from the Seven Countries Study, which looked at cardiovascular disease incidences across the globe, showed that while men in Crete had a predisposition for high cholesterol levels, relatively few died of heart disease because their diet focused on heart healthy fats found in olive oil. Look for extra virgin or virgin varieties, they’re the least processed, and use them instead of butter when cooking. Nuts: Walnuts are full of omega 3 fatty acids and, along with almonds and macadamia nuts, are loaded with mono and polyunsaturated fat. Plus, nuts increase fiber in the diet. And like olive oil, they are a great source of healthy fat. Berries: Blueberries, raspberries, strawberries, whatever berry you like best are full of anti inflammatories, which reduce your risk of heart disease and cancer. Legumes: Fill up on fiber with lentils, chickpeas, and black and kidney beans. They’re packed with omega 3 fatty acids, calcium, and soluble fiber. Spinach: Spinach can help keep your ticker in top shape thanks to its stores of lutein, folate, potassium, and fiber. But upping your servings of any veggies is sure to give your heart a boost. The Physicians’ Health Study examined more than 15,000 men without heart disease for a period of 12 years. Those who ate at least two and a half servings of vegetables each day cut their risk of heart disease by about 25%, compared with those who didn’t eat the veggies. Each additional serving reduced risk by another 17%. Flaxseed: Full of fiber and omega-3 and omega 6 fatty acids, a little sprinkling of flaxseed can go a long way for your heart. Top a bowl of oatmeal or whole grain cereal with a smidgen of ground flaxseed for the ultimate heart healthy breakfast. Soy: Soy may lower cholesterol, and since it is low in saturated fat, it’s still a great source of lean protein in a heart healthy diet. Look for natural sources of soy, like edamame, tempeh, or organic silken tofu. And soy milk is a great addition to a bowl of oatmeal or whole grain cereal. But watch the amount of salt in your soy: some processed varieties like soy dogs can contain added sodium, which boosts blood pressure. This dish takes some time to prepare, but cooking it is a snap. Steaming the food in parchment is a great way to retain a food’s nutrients. The heart-healthy Omega-3 fatty acids in the salmon, calcium and iron in the broccoli, and fiber and antioxidants in the sweet potatoes. Prep Day: Sprinkle salmon on both sides with salt and pepper. Set aside. Fold 4 sheets of parchment paper in half and then in half again. Starting at the folded edge, cut each paper into a half-heart shape. Unfold so that you end up with 8 paper hearts. Lightly brush both sides of the paper with olive oil. Place 1/4 of the vegetables on half of one paper heart. Place a salmon fillet on top of vegetables. Combine the parsley, cilantro, lemon peel, thyme, and garlic in a cup, then sprinkle 1/4 of this mixture over the salmon and vegetables. Fold the top of the heart over the fish and vegetables, then crimp and fold the edges to tightly seal. 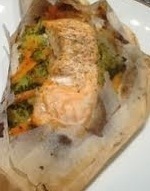 Repeat with remaining parchment paper, vegetables, salmon, and herbs so you end up with 8 packages. Place in freezer bags and freeze flat. Serve Day: Thaw. Heat oven to 425°F. Place on a baking sheet lightly coated with nonstick cooking spray. Bake 10 minutes or until the paper is puffy and browned. Carefully cut open each package with the tip of a sharp knife, releasing the steam. Transfer contents to a plate and eat.